Introduction. 1. Corporate Identity: The Bauhaus in Dialogue with the Public Part I: Meeting the Public 2.The Networks: How the Directors Shaped Perceptions3. The Exhibitions: Promoting the Bauhaus Idea4. The Events: Staging Bauhaus for the Public Part II: Designing Printed Matter 5. The Propaganda: Graphic Design and the Printing/Advertising Workshops 6. The Money: New Typography in Everybodys’ Pockets (by Nele Heise)7. The Prints: Books and Magazines in New Typography Part III: The Voice of the Others 8. The Media: Monitoring Press Coverage9. The Commentaries: Instrumentalizing the Press Response10. The Periodicals: Successful Agenda-Setting. Conclusion. 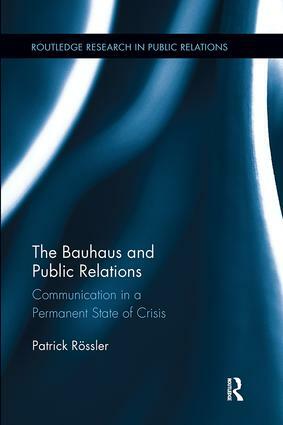 Patrick Rössler is chair of Communication Studies and currently serving as Vice President at the University of Erfurt, Germany. His research interests include media effects, visual communication, and media history. Previous publications include "The Bauhaus at the Newsstand" (2009) and the Exhibition catalogue "VIEWing our LIFE and TIMES" (2006).